I saw this funny story and thought I would pass it along to add a little humor to your weekend. I never dreamed slowly cruising on my motorcycle through a residential neighborhood could be so incredibly dangerous! Little did I suspect. I was on Brice Street – a very nice neighborhood with perfect lawns and slow traffic. As I passed an oncoming car, a brown furry missile shot out from under it and tumbled to a stop immediately in front of me. It was a squirrel, and must have been trying to run across the road when it encountered the car. I really was not going very fast, but there was no time to brake or avoid it — it was that close. I hate to run over animals, and I really hate it on a motorcycle, but a squirrel should pose no danger to me. Inches before impact, the squirrel flipped to his feet. He was standing on his hind legs and facing my oncoming Valkyrie with steadfast resolve in his beady little eyes. He shot straight up, flew over my windshield, and impacted me squarely in the chest. Instantly, he set upon me. If I did not know better, I would have sworn he brought 20 of his little buddies along for the attack. Snarling, hissing, and tearing at my clothes, he was a frenzy of activity. As I was dressed only in a light T-shirt, summer riding gloves, and jeans this was a bit of a cause for concern. This furry little tornado was doing some damage! It really should have. The squirrel could have sailed into one of the pristinely kept yards and gone on about his business, and I could have headed home. No one would have been the wiser. But this was no ordinary squirrel. 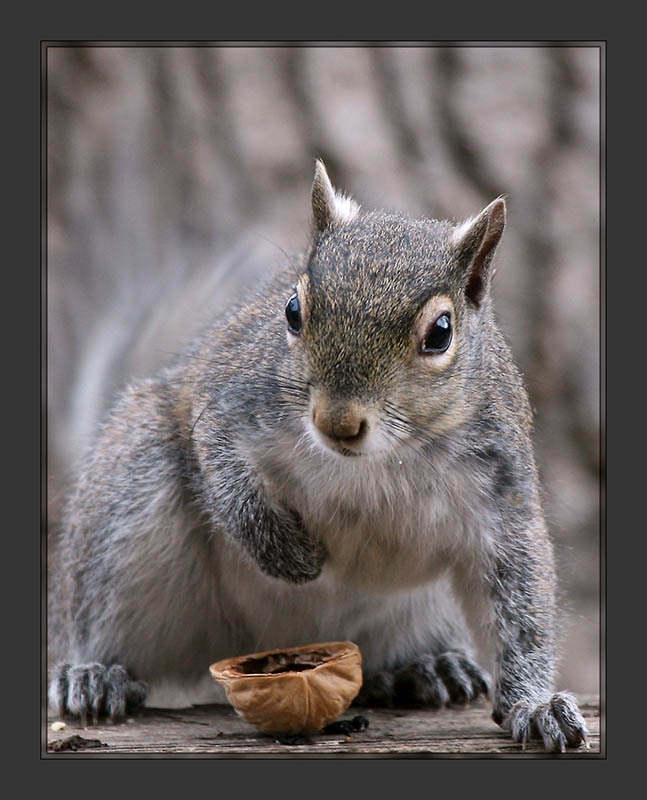 This was not even an ordinary angry squirrel. This was an EVIL MUTANT ATTACK SQUIRREL OF DEATH! Somehow he caught my gloved finger with one of his little hands and, with the force of the throw, swung around and with a resounding thump and an amazing impact, he landed squarely on my BACK and resumed his rather antisocial and extremely distracting activities. He also managed to take my left glove with him! The situation was not improved. Not improved at all. His attacks were continuing, and now I could not reach him. I was startled, to say the least. The combination of the force of the throw, only having one hand (the throttle hand) on the handlebars, and my jerking back unfortunately put a healthy twist through my right hand and into the throttle. A healthy twist on the throttle of a Valkyrie can only have one result. This is what the Valkyrie is made for, and she is very, very good at it. The engine roared and the front wheel left the pavement. 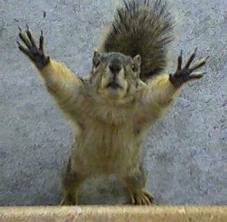 The squirrel screamed in anger. The Valkyrie screamed in ecstasy. I screamed in . well .. I just plain screamed. The man and the squirrel are both screaming bloody murder. With the sudden acceleration I was forced to put my other hand back on the handlebars and try to get control of the bike. This was leaving the mutant squirrel to his own devices, but I really did not want to crash into somebody’s tree, house, or parked car. Also, I had not yet figured out how to release the throttle…my brain was just simply overloaded. I did manage to mash the back brake, but it had little effect against the massive power of the big cruiser. About this time the squirrel decided that I was not paying sufficient attention to this very serious battle (maybe he was an evil mutant NAZI attack squirrel of death), and he came around my neck and got INSIDE my full-face helmet with me. As the faceplate closed part way, he began hissing in my face. I am quite sure my screaming changed intensity. It had little effect on the squirrel, however. The RPMs on the Dragon maxed out (since I was not bothering with shifting at the moment), so her front end started to drop. Now picture a large man on a huge black and chrome cruiser, dressed in jeans, a very raggedly torn T-shirt, wearing only one leather glove, roaring at probably 80 mph, still on one wheel, with a large puffy squirrel’s tail sticking out of the mostly closed full-face helmet. By now the screams are probably getting a little hoarse. Finally I got the upper hand … I managed to grab his tail again, pulled him out of my helmet, and slung him to the left as hard as I could. This time it worked … sort-of. Spectacularly sort-of … so to speak. Picture a new scene. You are a cop. You and your partner have pulled off on a quiet residential street and parked with your windows down to do some paperwork. Suddenly a large man on a huge black and chrome cruiser, dressed in jeans, a torn T-shirt flapping in the breeze, and wearing only one leather glove, moving at probably 80 mph on one wheel, and screaming bloody murder roars by, and with all his strength throws a live squirrel grenade directly into your police car. I heard screams. They weren’t mine… I managed to get the big motorcycle under control and dropped the front wheel to the ground. I then used maximum braking and skidded to a stop in a cloud of tire smoke at the stop sign of a busy cross street. I would have returned to ‘fess up (and to get my glove back). I really would have. Really… Except for two things. First, the cops did not seem interested or the slightest bit concerned about me at the moment. When I looked back, the doors on both sides of the patrol car were flung wide open. The cop from the passenger side was on his back, doing a crab walk into somebody’s front yard, quickly moving away from the car. The cop who had been in the driver’s seat was standing in the street, aiming a riot shotgun at his own police car. So, the cops were not interested in me. They often insist to “let the professionals handle it” anyway. That was one thing. The other? Well, I could clearly see shredded and flying pieces of foam and upholstery from the back seat. But I could also swear I saw the squirrel in the back window, shaking his little fist at me. That is one dangerous squirrel. And now he has a patrol car. A somewhat shredded patrol car but it was all his. bwahahahaha. Now that was some ride, and the funniest thing I have heard in a while.